The Cardassians are a humanoid species from the Alpha Quadrant. They are native to the planet Cardassia Prime, capital world of the Cardassian Union. 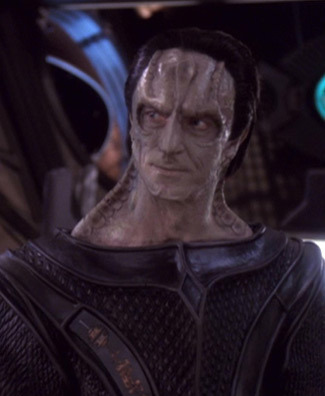 Known throughout the Alpha Quadrant for their ruthlessness, the Cardassians are one of the greatest enemies of the United Federation of Planets and Klingon Empire, especially when they joined the Dominion in 2373. Their xenophobic attitude towards other species is well established throughout the quadrant after the Setlik III massacre during the Cardassian War, as well as when their atrocities during the Occupation of Bajor were revealed after their withdrawal in 2369. The Cardassians took heavy casualties during the Dominion War, their way of life virtually diminished. They were forced to close off their borders and rebuild their once great nation. They showed signs of life (and hostility) to the Federation in the early 2380s, and proved once again their dominance in the Alpha Quadrant in 2384, when they defeated several Sindareen Military Units and staked claim to portions of the Gateway Sector. Legate Levat is ruler of the Cardassian Union and Cardassia Prime.